Is it true that nickel can cause allergies? And if so, can wearing a watch and bracelet made of nickel alloys be harmful to one's health? For the past few years, there has been a lot of talk of allergies caused by metal alloys containing nickel that are in constant contact with the skin. In order to have a better understanding of this phenomenon, we will take a closer look at nickel and the allergies that this metal may cause. The condition that we call an allergy is rather complex and cannot be explained without going into great detail. In general, however, an allergy is a biological reaction produced by a particular substance that affects certain individuals in varying degrees, although many other people may not be affected at all. Allergies are usually unpredictable and can even sometimes cause violent responses. It has been estimated that about 10% of people in normally good health are susceptible to some kind of allergy. An allergy to nickel is quite real although, in some ways, it is a bit surprising since our bodies need a certain quantity of metals to maintain good health. This is the case for zinc, cobalt, copper and nickel that are found in our bodies in the form of trace elements. Their presence in insufficient quantities or their total absence can result in rather serious medical difficulties. For example, the lack of nickel creates problems in growth, reproduction and longevity in animals. On the other hand, too large a concentration of these normally necessary trace minerals can provoke physiological perturbations in certain individuals. The person in question becomes the victim of a chronic disorder with varying levels of gravity depending on the amount to which he or she is exposed. The symptoms are not the same for everyone and, at any given concentration, reactions can vary from intensely serious to hardly noticeable. Nickel is found in the earth's crust as a naturally occurring silvery metal in the form of various minerals. Primary nickel is obtained from mining its ore and from nickel matte. Denoted by the symbol Ni, this element has the atomic number 28 and is chemically located in the category of metals between cobalt and copper. Nickel is plentiful in nickel-iron meteorites as well as at the centre of our planet, but is found to a lesser degree on the Earth's surface, ranking in 24th position by order of abundance. Some of its physical characteristics are given in Figure 1. From an historical point of view, nickel was already being used in 3000 B.C. in the form of an alloy that was probably of meteoritic origin. It was only isolated as an element in 1751 by the Swedish chemist Axel Fredrik Cronstedt. But, it was only in the 19th Century that nickel was extracted on an industrial scale, first in Norway then in New Caledonia following the discovery of important deposits in these countries. Today, Canada is the world's largest producer of this metal. In 1890, nickel was introduced into cast metal and steel alloys in order to improve their mechanical characteristics. A little less than 100 years ago, researchers from a number of countries, working independently and concurrently, invented the all-important stainless steel. Today, about 40% to 50% of all nickel produced in the world goes into making this amazing material. The most common category of stainless steel is 10-18, which contains 10% nickel and 18% chrome. It is used in the manufacture of many consumer items such as sinks, pots and pans, kitchen utensils and flatware, as well as roof gutters and other devices that come into contact with water or other fluids. 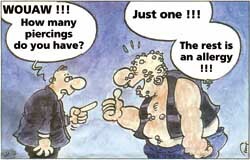 Figures 2&3: The current fashion of body piercing has been much talked about in the media recently as seen by these newspapers published in the Swiss town of La Chaux-de-Fonds. In the domain of watches, one of the most obvious uses for nickel is in stainless steel that is used in the production of water-resistant cases. But this is not its only use. Nickel and watchmaking have many other less apparent connections as well. First, an alloy of nickel, copper and zinc called nickel silver has been used for nearly 150 years in the production of plates and bridges in very high quality timepieces. This particular composition, which is about 15% to 20% Ni, replaced the customary use of brass. Secondly, nickel silver also replaced silver in the production of cases for inexpensive watches before the invention of stainless steel. Thirdly, pure nickel is used to electroplate watch parts such as bridges and plates made of brass in order to prevent their oxidation. Just a thin protective layer of nickel is enough to maintain the shiny metallic appearance of these watch components. Another use for nickel is in the manufacture of balance springs and pendulum rods. In this respect, watchmaking owes a great service to Charles-Edouard Guillaume (1861-1938), a Swiss who worked at the International Bureau of Weights and Measures. In 1920, he was awarded a Nobel Prize in Physics for his discovery of anomalies in nickel-steel alloys . A fortuitous observation by Guillaume regarding the coefficient of expansion of nickel-iron alloys led to the discovery of Invar, a ferronickel containing 36% nickel with a very low coefficient of expansion, as well as a variation of Invar that Guillaume called Elinvar, whose thermo-elastic coefficient is practically zero between -60� C and +70� C. Applications of these new alloys were quickly recognized, finding uses in precision pendulum rods, watch balance springs, geodetic baselines, length standards, thermostats and a host of other devices where high precision is important. Guillaume's total compensating balance for high precision watches and chronometers was perfected by using an Elinvar hair spring. Nickel is also used in common every day items, such as coins, metal buttons for clothes, costume jewellery including bracelets, necklaces and earrings, as well as knickknacks and souvenirs, etc. 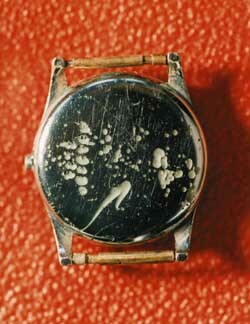 Figure 4: The back of a chrome-plated nickel silver watch that has been corroded by perspiration. What causes allergies to nickel? In order for an allergic reaction to occur, the skin of a sensitive individual must be in direct contact with the object containing the nickel. For watches, this necessarily means the case or the bracelet. Another condition for an allergic response is that the nickel must be liberated rather easily from its alloy onto the skin in the form of cations, or positively charged particles. Thirdly, these positive ions must be transported by some sort of fluid serving as an electrolyte. This liquid most often is sweat, but may also be water from the sea or from a swimming pool. The stainless steel used in the manufacture of watchcases liberates varying amounts of nickel ions depending on the nature of the alloy and the proportions of the individual components. A stainless steel created for medical purposes gives off practically no nickel. For those persons who are allergic to nickel, which usually manifests itself in the form of dermatitis, they should definitely avoid wearing costume jewellery or earrings made of nickel silver. In any case, earrings made of any nickel-containing material should never be used until a newly pierced ear or other body part heals completely. The current style of piercing ears, tongue, lips or other areas of the body using earrings or body rings made of metals containing nickel has become a major factor in the increase in nickel allergies today. Because of the popularity of this type of piercing, girls aged 10 to 15 years are at the highest risk for this type of allergy (Figures 2 and 3). Another important factor in the liberation of nickel ions is the condition of the metal surface that is in contact with the skin. Rough or porous surfaces retain the electrolytic fluid, usually perspiration, and thus become very active zones for producing the allergenic cations. 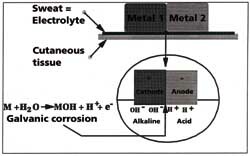 The resulting corrosion of the metal then generates even higher concentrations of the metal ions. Upon examination of the back of a chrome-plated watch case that has been attacked by sweat, it is surprising to see how much corrosion has taken place and, therefore, easy to understand why the wearer's skin can become sensitive (Figure 4). In addition to stainless steel watches and bracelets, the bi-colour models made of gold and steel can also be problematic for people with sensitive skin. Gold and stainless steel have different electric potentials and the transportation of ions in the sweat is accelerated. Therefore, an increase in galvanic corrosion results in an even greater risk of allergy (Figure 5). The rate of corrosion and the rate of allergies are closely linked. When the two metals are soldered together, the corrosion often occurs at the joint. A cavity then appears becoming the site of even more erosion (Figure 6). The solution to the nickel-allergy problem is to use alloys that give off no or very little nickel cations. As mentioned above, there is a type of stainless steel used in medical devices that liberates hardly any nickel ions. It is classified as AISI 316 L stainless steel. People who are sensitive to nickel might want to avoid watches that contain any nickel at all. Alternatives might include models such as Swatch that are made of synthetic materials, or perhaps the prestige timepieces made of pink or yellow gold. White gold (also called grey gold) often contains nickel that exceeds the acceptable levels for nickel-sensitivity. Gold-plated watches worn over long periods of time are also at risk of causing allergies. The thin layer of gold eventually wears off and exposes the skin to the nickel-containing metal beneath as shown in Figure 7. Figure 5: This demonstrates a case of galvanic corrosion aggravated by the presence of two metals having different electric potentials. 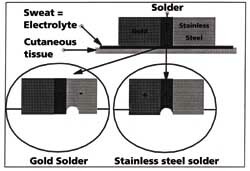 Figure 6: An example of the galvanic corrosion of two metals that have been soldered together. The problems relating to nickel allergies are important enough that the European Community is drafting legislation to control these materials. A number of individual countries have already taken measures concerning various objects that are made with metal containing nickel. With a statue enacted June 27 1989, Denmark is the first. This legislation forbids the importation and production of a whole list of items that liberate quantities of nickel greater than 0.5 microgram per square centimetre over a period of one week. These include metal buttons, watches, earrings necklaces, bracelets and other objects that come in contact with the skin. This statute also defines a test method using DMG (dimethylglyoxime in ammonia) that is placed on the object after removing any varnish or coating from its surface. The proposed European Community directive is similar to that of Denmark. Difficulties relating to the application and enforcement of such standards are not insurmountable because suitable materials already exist. However, in the production of watches, the cost of these substitutes is a non-negligible factor. The industry should be aware of these proposed new regulations and start preparing for their enactment. 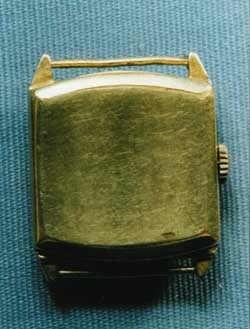 Figure 7: Even gold-plated watches are subject to corrosion as the gold wears off. The ridges are the most likely to be affected. While waiting for such directives, there are several precautions that can be followed to prevent or diminish the risk of nickel allergies from watches. First, remove the watch at night to decrease the length of time it is in direct contact with the skin. Secondly, wipe the case often with a clean, dry cloth. A slightly damp cloth can be used if the watch is water-resistant. In addition to preventing the build-up of irritating nickel ions, this is a basic common sense measure of good hygiene. Watchmakers have often expressed how surprised they are at the nonchalant attitude of many watch owners when it comes to the cleanliness of an object in direct and continuous contact with their skin. Thirdly, after perspiring heavily, the watch should be removed and washed. By caring for one's watch in this way, the risk of allergies to nickel can be greatly reduced.